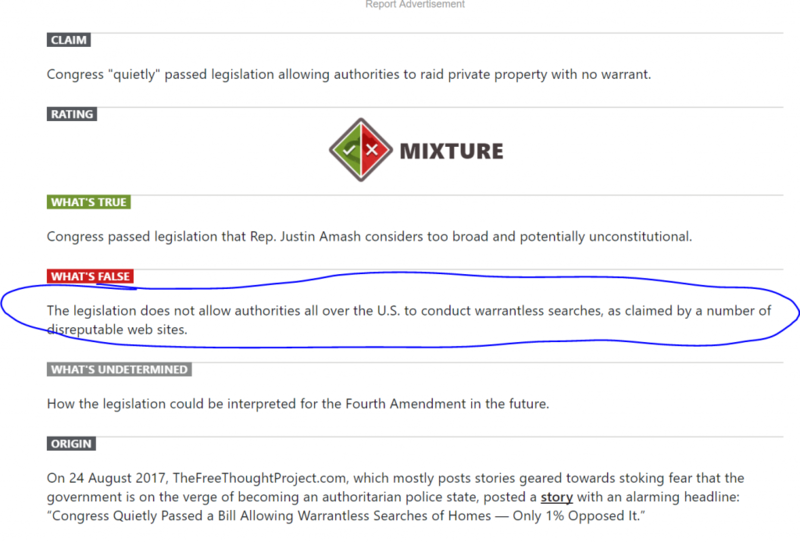 Snopes attempted to debunk a very real threat to the 4th Amendment by making up a false statement and using it as a red herring. 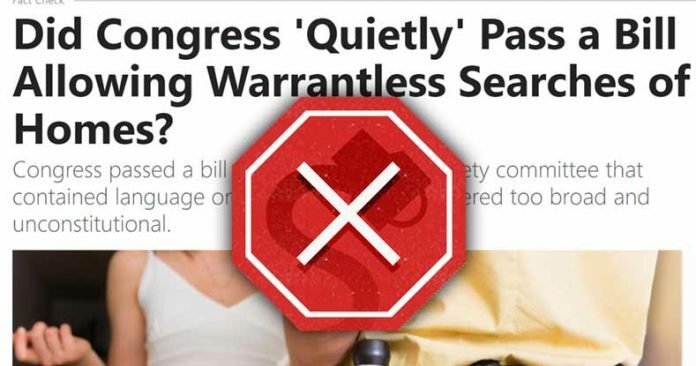 Snopes.com has made its name as the truthful source that debunks crazy conspiracy theories and “fake news” on the internet, but its response to a story on legislation allowing warrantless searches is in need of its own fact check. As Snopes correctly noted, the story in question was published by The Free Thought Project on Aug. 24, and is on the subject of House Joint Resolution 76. What Snopes does not mention is that up until TFTP reported on the legislation, it received virtually no media coverage, aside from criticism from Congressman Justin Amash on social media. The problem with this legislation is that even if the commission gives advanced notice that it will be entering a private property, that advanced notice is not a search warrant. Under the Fourth Amendment, a search warrant can only be obtained with the consent of a judge, and it must have probable cause laid out by law enforcement. The bill received unanimous approval in the Senate, and Justin Amash was one of just five members who voted against it in the House. As he noted on Twitter, the bill gives the government the authority to enter and search private property in parts of Washington DC, Virginia, and Maryland without a warrant. This bill does authorize a #4thAmendment violation. Congress has a duty not to pass such broad language even if Constitution nullifies it. As Amash also noted, the language of the bill is entirely too broad. “‘Safety’ presumably includes preventing criminal/terrorist activities near WMATA. Bill doesn’t contemplate potential abuse of MSC authority,” he wrote. "Safety" presumably includes preventing criminal/terrorist activities near WMATA. Bill doesn't contemplate potential abuse of MSC authority. Read carefully. It applies to *any* property "adjacent to the WMATA Rail System." You ignored the phrase "including, without limitation." However, the article Snopes was attempting to debunk was based entirely on the facts surrounding the bill—its text, who voted for and against it, and how it was interpreted by elected officials who were charged with the power of determining whether it becomes law. Never once did the story claim this bill would affect the entire United States, or that it would completely put an end to the Fourth Amendment. As for Snopes’ definition of TFTP’s reputation, an outlet that “mostly posts stories geared towards stoking fear” sounds a lot like the description of the many mainstream media outlets The Free Thought Project debunks on a regular basis. As for warning that “the government is on the verge of becoming an authoritarian police state,” in many ways that is essentially what the government already is—an authoritarian state that uses violence and intimidation to enforce its laws. The Free Thought Project is dedicated to exposing stories of government corruption and police misconduct based on facts and evidence, while also fostering the creation and expansion of liberty-minded solutions to modern day tyrannical oppression. If we were solely focused on brainwashed fear-mongering, we would be no better than the mainstream media.